Wasserstein 10-inch Digital Photo Frame - Motion Sensor, 1024x600 High Resolution Widescreen LCD with 720p HD Video Playback Plus Calendar and Clock Function Picture Frame by Wasserstein at DJC. MPN: 4897080225258. Hurry! Limited time offer. Offer valid only while supplies last. ✔ SIMPLY PLUG & PLAY - Keep your most treasured and cherished memories on display all year round. With no software setup required, simply plug in your USB drive or memory card and your photos/videos will automatically be compiled into a beautiful high-resolution slideshow. Alternatively, you can take a more proactive approach in deciding how to display your images by selecting from our large collection of transition effects and the different slideshow orders. ✔ MOTION SENSOR - The device has a built-in sensor, that allows the frame to turn on when motion is detected and to automatically turn off in the absence of movements, allowing for energy-conscious viewing and it also means that you never have to worry about forgetting to turn off the device. A helpful remote control is also included, making it simple to control the frame from a distance. 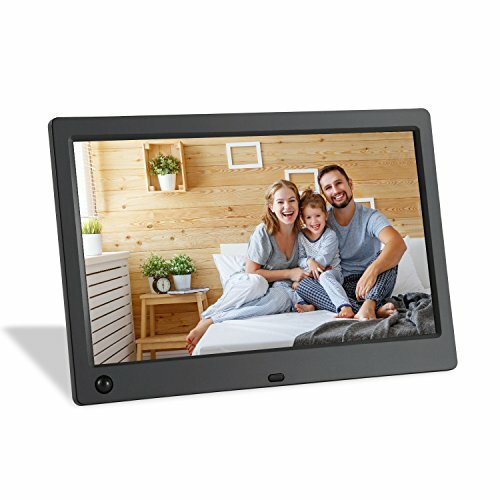 ✔ CLOCK & CALENDAR FUNCTION - This electronic photo frame does more than just display photos, it has a few extra features packed in including a clock and calendar viewing mode. Through which you can present all your favorite shots in the background of the calendar setting. This function makes this frame a truly convenient and versatile device that is sure to make it a great addition to any home. ✔ PACKAGE INCLUDES - 1x 10" Digital Photo Frame, 1x Remote Control (with lithium battery), 1x DC Power Adapter, 1x Back Stand and 1x User Manual. Wasserstein guarantee - If you are not satisfied with our products, please get in touch with us and we will try to resolve the issue. If we can't resolve the problem to your satisfaction, you will receive a full refund - no questions asked.